Trash your cash, but is plastic fantastic? Growth in mobile smartphone payments is clear. We all know that cash is becoming more and more obsolete in this modern age where digital payment technology and apps, like PayNow for Stripe, rule the roost. In fact, recent studies show that cash purchases in developed countries such as Canada will account for as little as 10% of money spent in 2030. These trends are most noticeable in young age brackets, where as much as 47% of people say they would use a mobile wallet if it was accessible on their current phone. Consistent with the projected decline in cash payments is an increasing readiness of consumers to pay using smartphones, using apps such as PayNow for Stripe. While the statistic is impressive at nearly 40% of Western Europeans ready to use mobile phones for payments, the real surprise is that in developing nations including Africa, which are often thought of as largely cash driven economies, more than 70% of consumers are ready to make payments using smartphones. Those living in technologically less developed countries tend to be more enthusiastic about digital innovation than in markets where it is readily available. The readiness of people to use mobile application payments such as PayNow for Stripe, is not only at the expense (no pun intended) of cash, but also plastic cards such as credit and debit cards, which still account for the majority of payment methods today. So what is holding people back from moving over to using mobile wallets, smartphone payments and other digital apps to make and receive payments? Unsurprisingly, the main issues people care about are security, ubiquity and functionality. That is, people need to be assured that the applications and systems used are safe and secure, that they are commonly accepted by the majority of vendors and that the applications have user-friendly functions such as enabling receipt to be emailed to them. 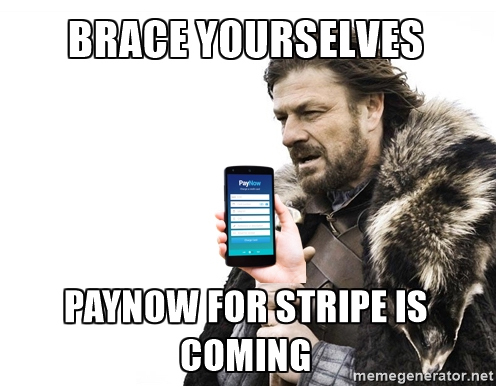 Enter, PayNow for Stripe. PayNow for Stripe is embracing the trend to mobile smartphone payment options while providing a platform that accepts the most commonly used payment methods – plastic credit and debit cards. What is clear is that plastic credit cards are still the most commonly used and trusted payment options, partly because of their strong security credentials and their ease of use. PayNow for Stripe facilitates users to keep using this method of payment while allowing them to transition to digital payment processing systems. All this via the use of NFC technology for Android and photographic recognition for iPhone simplifies the payment process in a secure environment at the touch of a button. In essence, PayNow for Stripe gives you the best of both the plastic and digitals worlds, to use in the real world. Sam is a Director of PayNow, and manages the company's commercial interests. A lawyer by profession, Sam's calm, perceptive and practical leadership ensures the PayNow team moves ever forward.